19 And I shall have to break the pride of your strength and make your heavens like iron and your earth like copper (Leviticus 26). Today (2004 July 12, Tammuz22) I, Gordon, am the happiest and most spiritually calm that I have been since 1991Shebat21 (1992February1), when I first worked out the date of Armageddon from the Exedenic Times. Because in 1988, when I first saw the JW interpretation of Daniel 4 as referring to the Gentile Times, I was captivated. I couldn't articulate at that time what was captivating me. But now I can. It was a two dimensional symbolic algebra. I did a degree in pure maths at Cambridge and algebra was what I was naturally good at. I have a feel for algebra. But the idea that one set of words could have two symbolic meanings was new to me. It is rather like a quadratic verbal equation. So here 16 years later, I thought that Jesus Christ has helped me to the point where I could see the full depth of Daniel 4 (but as usual I was not quite there yet). On the 16 year journey I have seen that the whole bible is written in the same symbolic code as Daniel 4. There are in fact 3 symbolic meanings to this chapter of Daniel. It is a 3 dimensional symbolic algebra. It has an event symbolic thread and two word symbolic threads. There are 4 kings over Isaac who lose thier kingship for 7x in each of the two word symbolic threads (one thread for each presence). These is one king in the event symbolic thread. And 21 years later in 2013Iyyar, Gordon theorized (correctly) that the contest of 1Kings18 involved a 7x prophetic malediction on the LWs in further fulfilment of Daniel. In fact the LW Exedenic Times from 2012Sivan15 to 2012Sivan15 was a key malediction to the 1Kings18 contest. 28 However, there exists a God in the heavens who is a Revealer of secrets, and he has made known to King Nebuchadnezzar what is to occur in the final part of the days. Your dream and the visions of your head upon your bed -- this it is: (Daniel 2 NWT). 29 At the end of 12 moons he happened to be walking upon the royal palace of Babylon. 30 The king was answering and saying: Is not this Babylon the Great, that I myself have built for the royal house with the strength of my might and for the dignity of my majesty? 33 At that moment the word itself was fulfilled upon Nebuchadnezzar, and from mankind he was being driven away, and vegetation he began to eat just like bulls, and with the dew of the heavens his own body got to be wet, until his very hair grew long just like eagles' [feathers] and his nails like birds' [claws]. 34 And at the end of the days I, Nebuchadnezzar, lifted up to the heavens my eyes, and my own understanding began to return to me; and I blessed the Most High himself, and the One living to time indefinite I praised and glorified, because his rulership is a rulership to time indefinite and his kingdom is for generation after generation. 36 At the same time my understanding itself began to return to me, and for the dignity of my kingdom my majesty and my brightness themselves began to return to me; and for me even my high royal officers and my grandees began eagerly searching, and I was reestablished upon my own kingdom, and greatness extraordinary was added to me. In our case we thought: Is this not the Lords' Witnesses church that we have built by the strength of our understandings for the dignity of our rulership over the faithful. But the truth is, no. Every single understanding that we have was revealed to us by God at a time of his choosing. That is what our 552+21 odd mistakes in predicting the 2nd and 3rd fire sign are teaching us. No human is quite intelligent enough to see any new part of God's plan clearly without a hand from the holy spirit. It is not about what we have seen with our minds. It is about what God has shown us due to our hearts. 7 times pass over a circular banding of iron, making a 7x iron/kingship malediction. 7 times pass over a circular banding of copper, making a 7x copper/priesthood malediction. The tree itself with its top in the heavens provides blessed food from a promised land and when it is cut down produces an Exedenic malediction. So these triple maledictions befall God's official people, and the sons of the 1NC in the first presence and the sons of the 1NC in the second presence. The the dream recital and the interpretation both mention the band of iron and the band of copper. This gives two extra fulfilments for each of the two word symbolic threads making 4 fulfilments in total of these 3 great 7x maledictions, the Exedenic, the Alienation and the Gentile Times. Then there are in addition two word symbolic threads for the fulfilment of the dream upon Nebuchanezzar. There is also a notable absence of any record of acts or decrees by the king during 582 to 575 BC (Gleason Archer, Vol 7 Expositor's Bible Commentary) . The sons of the ICC lose God (Jesus) as their secular head and so pay taxes to Caesar, for 7 Prophetic Times from 607Tishri15 to 2012Tishri15 (with a gap of 98 years due to the Maccabean Liberation liberation from the letter of 1Maccabees11 from Demetrius II to Jonathan Maccabeus telling the people to pay their taxes not to the King but to the temple in 145/144BC !! to Herod Antipater appointed by Julius Caesar over Judea in 47 BC), in the word symbolism of the fulfilment of the dream. This is the discontinuous Gentile Times. 2520 years after 607Tishri15 was 1914Tishri15. This was the end of the continuous Gentile Times. FDS3 was appointed over the 1NC saints on 1905Nisan17 and installed on 1905Sivan6 (1NC Pentecost). Russell on that day became the sacred king over God's people, the sons of the ICC, but not the secular king. For they were still subject to Caesar from a secular standpoint, since they paid taxes to him. There is a fulfilment upon the FDS3 (a 1NC administration). We know that Jesus and the first presence 1NC saints were married/appointed over the Kingdom on 2008Nisan22. This was the marriage of Jacob to Leah. The second presence 1NC saints could not marry Jesus on 2008Nisan22 due to the Kingdom Exedenic Times from 2008Nisan15 to 2015Nisan15 (which resulted from their riding the UN beast as a harlot church and putting the throne of Satan in the temple of God by joining the UN as an NGO associated with the DPI. Jacob marries Rachel, the second presence 1NC saints on 2015Iyyar20 (2nd marital appointment), 7 years later after celebrating in full the week of this woman (Genesis29:27). Their tree is not cut down until the 3 Passovers, which are great hacks/chops with the Passover axe. On 2019Tammuz24, the Watchtower is overturned/turned back, 40 days of Jonah after the late/completed 1st new Watchtower Passover on 2019Sivan14. And the birds (1NC saints) finish leaving its branches on 2018Sivan30 (the end of the 2,000 pigs of Mark5 from 2013Chislev11), and 2019Elul14 for the 2NC kings (430 years in Egypt a month for a day from 2005Iyyar14, when the Watchtower became Egypt). The band of copper in the dream (not in the interpretation or the fulfilment) is the Kingdom 1NC Alienation Times from 2008Tammuz9-2015Tammuz9 or Kingdom 2NC Alienation Times from 2008Heshvan21-2015Heshvan21. The band of iron in the dream (not in the interpretation or the fulfilment) is the Kingdom Gentile Times from 2012Tishri15 to 2019Tishri15. FDS1 also had an Exedenic, Alienation and Gentile Times malediction fall upon them for their harlotry with Rome as described in Revelation 17. Their Kingship malediction for 7 years could not be repaid until the Gentile Times itself had ended on 2012Tishri15. So the 3rd holy spirit in its entirety, both Leah and Rachel, both the first presence 1NCs and the second presence 1NCs were ineligible to rule over God's people from 2012Tishri15 to 2019Tishri15 due to the Kingship malediction upon them run up during their time as true churches but not repayable until after end of the Discontinuous Gentile Times on 2012Tishri15. Laodicean Gentile Times is 7 months from 2019Tishri15 - 2020Iyyar15, the festival Sabbath between the end of the world judicially on 2020Iyyar14 and the appointment of the Kingdom. This prevents Laodiceans from entering into God's rest in the ark. Laodicean Exedenic Times is 7 months from 2019Iyyar20 (the 6th day of Laodicean Cakes, when Laodiceans were re-appointed as a true church and immediately denied the blessing of the promised land of Zoar) to 2019Chislev20. Laodiceans can neither act as priests nor administrators in Zoar. They can act as priests after Zoar in the Kingdom of God however - and possibly as 2NC earthly baptized underlords. But they lose their original 2NC angels since they are not in the house of Rahab (the 1NC) and so do not keep on living and since they are vomited out of Jesus mouth and so cannot wield his authority and because they have played politics with divine authority and that is not what is wanted in the Kingdom of God. 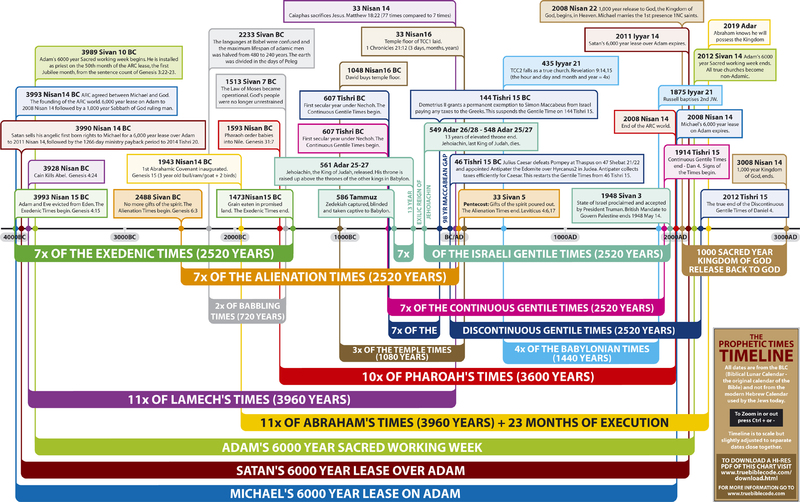 LW Gentile Times: 2012Tishri15 - 2019Tishri15, coincident with the Kingdom Gentile times. During this time the LWs could not have a secular king appointed by God. LW Exedenic Times: 2012Sivan15 - 2019Sivan15. This was a malediction preventing any saints from entering to the land of the 4EC (or preventing the LW congregation from entering further into its own land). LW 1NC Alienation Times: 2002Tammuz5 - 2009Tammuz5 (caused by Gordon, not by the church, from the installation of Laodicea to feed the 1NC reserves to the installation of FDS4 to feed them as priests). Aaron (the 2nd Holy Spirit) does not bless any external 1NC teaching or evangelism. But he (she) does bless our research. LW 2NC Alienation Times: 2004Chislev21 - 2011Chislev21 (starting at the installation of FDS4 to rule over the proselyte 2NCs). Aaron (the 2nd Holy Spirit) does not bless any external 2NC teaching or evangelism.. But he (she) does bless our research. 12 And in the 5th month, on the 10th day of the month, that is, [in] the 19th year of King Nebuchadrezzar, [586Ab10] the king of Babylon, Nebuzaradan the chief of the bodyguard, who was standing before the king of Babylon, came into Jerusalem. 13 And he proceeded to burn the house of Jehovah and the house of the king and all the houses of Jerusalem; and every great house he burned with fire. 14 And all the walls of Jerusalem, round about, all the military forces of the Chaldeans that were with the chief of the bodyguard pulled down. 15 And some of the lowly ones of the people and the rest of the people that were left remaining in the city and the deserters that had fallen away to the king of Babylon and the rest of the master workmen Nebuzaradan the chief of the bodyguard took into exile. 16 And some of the lowly ones of the land Nebuzaradan the chief of the bodyguard let remain as vinedressers and as compulsory laborers. 17 And the copper pillars that belonged to the house of Jehovah and the carriages and the copper sea that was in the house of Jehovah the Chaldeans broke to pieces and went carrying all the copper of them to Babylon. 18 And the cans and the shovels and the extinguishers and the bowls and the cups and all the copper utensils with which they used to minister they took. 19 And the basins and the fire holders and the bowls and the cans and the lampstands and the cups and the bowls that were of genuine gold, and those that were of genuine silver, the chief of the bodyguard took. 20 And the 2 pillars, the one sea, and the 12 copper bulls that were under [the sea], the carriages, that King Solomon had made for the house of Jehovah. There happened to be no weight [taken] of the copper of them - - all these articles. 21 And as regards the pillars, 18 cubits in height was each pillar, and a thread of 12 cubits itself would go around it; and its thickness was 4 fingerbreadths, it being hollow. 22 And the capital upon it was of copper, and the height of the one capital was 5 cubits; and as regards the network and the pomegranates upon the capital, all around, the whole was of copper; and the second pillar had just the same as these, also the pomegranates. The sons of the JAC lose their priesthood over the unsanctified sons of the ICC for 7 Prophetic Times from 586Ab10 when Nebuzaradan burnt Solomon's temple in Jerusalem and removed all the copper to Babylon, this being when the JAC priesthood ended over the sons of the law. When Zerubbabel's temple was rebuilt the priesthood were not sons of the JAC, because there was no ark in that temple, no most holy. When the Christian churches came the congregations over 20 were all saints in TCC1, TCC2 and TCC3 until 1934Tishri. Then on 1935Iyyar28-Sivan2 the Watchtower held the Washington DC convention where Rutherford announced: Behold the Great Crowd. Then in 1935Ab the 7 Times of the JAC-2-ICC Priesthood Malediction Times ended. Once again sons of the JAC could be priests to unsanctified sons of the ICC. So from the end of Solomon's temple to the end of the law, the sanctified were not priests and the unsanctified were mediating to the unsanctified. Then from Jesus' baptism onwards the sanctified were mediating to the sanctified but not to the unsanctified. Then from 1935Ab onwards, the sanctified were once again priests to the unsanctified. Hence the holy spirit moved President Rutherford to see and to declare the beginnings of the Great Crowd. Cannot apply to Jesus, who was without sin. So the simple concept that the 'second symbolism' of the whole account applies to Jesus as King is not correct. But the full decoding using the symbolic structure principle and the successive designations principle untangles the whole mass to reveal the 5 and perhaps 7 periods of 7 times mentioned above. The phrase '7 Times' appears 4 times in the account. Double designations are written in orange. 1Nebuchadnezzar, the king, [aklmwe take as 'the king' - the pathah being from the definite article? - it is in the emphatic state] to all of the peoples, the nations and the languages that are dwelling in all the earth: May your peace grow great. 2 The signs and the wonders that the God, the Most High has performed with me, it has seemed good to me to declare. 3 How grand his signs are, and how mighty his wonders are! His kingdom is a kingdom to time indefinite, and his rulership is for generation after generation. 4 I, Nebuchadnezzar, happened to be at ease in my house and flourishing in my palace. 5 There was a dream that I beheld, and it began to make me afraid. And there were mental images upon my bed and visions of my head that began to frighten me. 6 And from me an order was being put through to bring in before me all the wise men of Babylon, that they might make known to me the very interpretation of the dream. 7 At that time the magic-practicing priests, the conjurers, the Chaldeans and the astrologers were entering; and I was saying before them what the dream was, but its interpretation they were not making known to me. 8 And at last there came in before me Daniel, whose name is Belteshazzar according to the name of my god and in whom there is the spirit of the holy gods; and before him I said what the dream was. 9 Oh Belteshazzar, chief of the magic-practicing priests, because I myself well know that the spirit of the holy gods is in you and that there is no secret at all that is troubling you, tell [me] the visions of my dream that I have beheld and its interpretation. A tree in the midst of the earth, the height of which was immense. 11 The tree [emphatic state] grew up and became strong, and its very height finally reached the heavens, and it was visible to the extremity of the whole earth. A watcher, even a holy one, coming down from the heavens themselves. 14 He was calling out loudly, and this is what he was saying: Chop the tree [emphatic state] down, and cut off its boughs. Shake off its foliage, and scatter its fruitage. Let the beast flee from under it, and the birds from its boughs. 15 However, leave its rootstock in the earth [a['r>a], even with a banding of iron and of copper, among the grass of the field; and in the dew of the heavens let it be wet, and with the beast let its portion be among the vegetation of the earth. 25 And you they will be driving away from men, and with the beasts of the field your dwelling will come to be, and the vegetation is what they will give even to you to eat just like bulls; and from the dew of the heavens to you [ones] causing to be drenched, and 7 times themselves will pass over you, until you know that the Most High is Ruler in the kingdom of mankind, and that to the one whom he wants to he gives it. 26 And because they said to leave the rootstock that [belongs to] the tree [emphatic state not construct but used possessively], your kingdom will be sure to you after you know that the heavens are ruling. 28 All this befell Nebuchadnezzar, the king. 29 At the end of 12 lunar months he happened to be walking upon the royal palace that [was in] Babylon. 30 The king was answering and saying: Is not this Babylon, the Great [emphatic state], that I myself have built for the royal house with the strength of my might and for the dignity of my majesty? 37 Now I, Nebuchadnezzar, am praising and exalting and glorifying the King of the heavens, because all his works are truth and his ways are justice, and because those who are walking in pride he is able to humiliate. I, the king, Nebuchadnezzar, means there are 3 of them (like: I, myself, Daniel). I, Nebuchadnezzar, means two of them are Nebuchadnezzars. Dream + Recital + Interpretation (WRONG): Tree (5), Rootstock (Stump of roots) (3), King (3), Earth (2), Dew (3), Times (3), Banding (2), Heart (2). Dream + Recital (OK): Tree (5), Rootstock (Stump of roots) (2), King (1), Earth (2), Dew (2), Times (2), Banding (2), Heart (2). Narrative + Interpretation: Babylon (2), Tree (1/0), Nebuchadnezzar (8), Belteshazzar (6), Daniel (2), Rootstock (1), Chaldeans (1), Conjurers (1), Magic practicing priests (1), Astrologers (1), King (11), Lord (2), Earth (0), Dew (1), Times (2), Banding (0), House (2), Palace (2). 7 Times 7 years from 582 - 575 when there is little evidence of any legislation or construction (Expositor's Bible Commentary) 7 Prophetic Times, 2520 years, 607Tishri BC to 1914Tishri AD 7 years. 2001Nisan10/14 to 2008Nisan10/14. There was a Pharaoh at both ends of the Jewish line of rulers From Moses to Jehoahaz, from Tutmoses? to Pharaoh Necho. All rulers from Moses through the judges to Jehoahaz were saints, sons of the JAC, just as the blood line from Adam to Jesus were all saints. In the events Nebuchadnezzar, a named king, existed at the start and end of the 7x and actually in the middle. But in the world symbolism we only need the same class of people to exist at the start and end of the 7x. The Davidic kings were all the genetic sons of David, and of Jacob, but being saints there were also the born again sons of Jacob. So the Gentile Times is really a Spiritual Gentile Times, a period when no saint, no spiritual Jew, no sons of the JAC, no covenant son of Jacob, rules over God's official people, who are spiritual Isaac, as God's vassal. The tree of knowledge of good and bad represented God's kingship in the Garden of Eden, and the tree of life represented his priesthood. The story of Eden is about the tree of knowledge of good and bad, but Adam and Eve were thrown out to stop them eating from the tree of life. Likewise here, in the word symbolic meaning applying to sons of the JAC, the symbolism applies to their kingship malediction of the Gentile Times. But since the tree had a binding of Iron which is strong and represents authority or rulership and had a binding of Copper which was the metal used for all the priestly duties in the temple and so represents the priesthood, we deduce that there are two maledictions being represented here. And since there is one band of iron which goes one time around the stump and one band of copper that goes one time around the stump, both maledictions are 1 time of the 7 times that pass over the stump. In other words we have two 7x maledictions. These are described above. 1. The literal fulfilment on Nebuchadnezzar. 2. The twin maledictions on the sons of the JAC (for 7 Prophetic Times). 4. The twin maledictions on the sons of the 2NC (for 7 months). Now any saint who dies in the Watchtower (but not in Laodicea) after 2001Tishri30, dies without a water baptism and so loses his associated angel, since a son of Jacob (through the JAC) must also be a son of Isaac (through the ICC). These people may still end up in the Kingdom of God. They only go to Gehenna if they are unrepentant, and they will be unrepentant if they have tasted the powers of the next system of things, but no 2nd presence non reserve 1NC saint ever tasted them. The word 'Daniel' only appears in the phrase 'Daniel, whose name is Belteshazzar'. Daniel means 'the bible decoder' in all the word threads. Belteshazzar, is literal Daniel in the event symbolism and Gordon in the first word thread and the Reverend John Aquila Brown in the second word thread. OLD IDEAS - LARGELY INCORRECT! The event symbolic meaning of the dream of the two visions is given by Daniel and the fulfilment was on King Nebuchadnezzar who lost his kingship for 7 times which were 7 months (being realistic or the history books would have to record another king taking regnal years) and then was restored to his throne. 7 Times (2 narrative) 7 Times, in this case 7 years. 2520 days the literal meaning of 7 times according to Revelation 12. See  for the sentence counts of the numerical dimension of the code. 1 Nebuchadnezzar [The remnant of 1NC saints], to all of the peoples, the nations and the languages that are dwelling in all the earth: May your peace grow great. 2 The signs and the wonders that the God has performed with me, it has seemed good to me to declare. 8 And at last there came in before me Daniel [the bible decoder], whose name is Belteshazzar [Gordon] according to the name of my god and in whom there is the spirit of the holy gods; and before him I said what the dream was. 9 Oh Belteshazzar, because I myself well know that the spirit of the holy gods is in you and that there is no secret at all that is troubling you, tell [me] the visions of my dream that I have beheld and its interpretation. A tree [FDS3] in the midst of the earth [the earthly administration of Abraham's seed, FDS4 is at the end of the earth, not in the midst of it], the height of which was immense. 11 The tree [FDS3] grew up and became strong, and its very height finally reached the heavens, and it was visible to the extremity of the whole earth. A watcher, even a holy one, coming down from the heavens. 14 He was calling out loudly, and saying this: Chop the tree [FDS3/WSS2/GNS2] down, and cut off its boughs. Shake off its foliage, and scatter its fruitage. Let the beast flee from under it, and the birds from its boughs. 15 However, leave its rootstock in the earth, even with a banding that [is made of] iron and copper, among the grass of the field; and in the dew of the heavens let it be wet [1AC baptism], and with the beast let its portion be among the vegetation of the earth. 16 Let its heart be changed from that of mankind, and let the heart of a beast be given to it [GNS2 lose their spirituality, they act with an animalistic heart] and let 7 times pass over it [2001Tishri30/Heshvan7-2008Tishri30/Heshvan7, Miriam re-admitted]. 28 All this befell Nebuchadnezzar [The remnant of the 2nd presence 1NC saints]. 36 At the same time my understanding itself began to return to me, and for the dignity of my kingdom my majesty and my brightness themselves began to return to me; and for me even my high royal officers and my grandees began eagerly searching [the angels and resurrected 1NC saints], and I was reestablished upon my own kingdom [In heaven in the Kingdom of God on 2008Elul19, when Miriam returns], and greatness extraordinary was added to me. The Earth (2) The heavenly administration of God's people (the administration of the 1AC under Melchizedek). Leave the JWs in the 1AC. Dew (1) of the heavens Baptism of those in GNS2 after its DFD and LWs after they are DFD is heavenly water into the 1AC. 7 Times (2 - narrative) 7 Times, which are 7 years from 2001Tishri30 when the Watchtower lost its water baptism until 2008Tishri30 when the 1NC saints start ruling again after Armageddon. And then from 2007Adar when the last 2NC saint dies until 2014Adar when they start ruling again in the Kingdom of earth. Babylon (2) Babylon the Great, the prison for God's true people, the sons of the FRC. This is all false religion. Chaldeans (1) JWs (Citizens of greater Babylon). Isn't this Babylon that I myself built ? No, although they treat it like it is. 1 The king [Jesus], [aklm we take as 'the king' - the pathah being from the definite article? - it is in the emphatic state] to all of the peoples, the nations and the languages that are dwelling in all the earth: May your peace grow great. 2 The signs and the wonders that the Most High has performed with me, it has seemed good to me to declare. 4 I, the king, happened to be at ease in my house and flourishing in my palace. 6 And from me an order was being put through to bring in before me all the wise men of Babylon [all the wise guys in all false religions], that they might make known to me the very interpretation of the dream. 7 At that time the magic-practicing priests [General bible interpreters], the conjurers, the Chaldeans [everyone in all false religions, i.e. in Babylon the great] and the astrologers were entering; and I was saying before them what the dream was, but its interpretation they were not making known to me. 8 And at last there came in before me Daniel [the bible decoder], whose name is Belteshazzar [John Aquila Brown] according to the name of my god and in whom there is the spirit of the holy gods; and before him I said what the dream was [Jesus showed Reverend John Aquila Brown that there was a further meaning to the dream]. 9 Oh chief of the magic-practicing priests [Gordon], because I myself well know that the spirit of the holy gods is in you and that there is no secret at all that is troubling you, tell [me] the visions of my dream that I have beheld and its interpretation. 28 All this befell the king [Jesus]. 29 At the end of 12 lunar months he happened to be walking upon the royal palace [of Nebuchadnezzar] that [was in] Babylon [Babylon was in Babylon the great, Jesus was in Ezekiel in Babylon at the start of the Gentile Times]. 30 The king [Jesus] was answering and saying: Is not this the Great [Nation of Israel], that I myself have built for the royal house [of my saints] with the strength of my might and for the dignity of my majesty? 33 At that moment the word itself was fulfilled upon the king, and from mankind he was being driven away, and vegetation he began to eat just like bulls, and with the dew of the heavens [the heavenly water baptism into the 1AC] his own body got to be wet [1NC saints, his wife, his body, disfellowshipped and being only in the 1AC], until his very hair grew long just like eagles' [feathers] and his nails like birds' [claws] [1NC saints developed wisdom at the end of the Gentile Times and so founded the Watchtower]. 34 And at the end of the days I, the king, lifted up to the heavens my eyes, and my own understanding began to return to me; and I blessed the Most High himself, and the One living to time indefinite I praised and glorified, because his rulership is a rulership to time indefinite and his kingdom is for generation after generation. 37 Now I, the king, am praising and exalting and glorifying the King of the heavens, because all his works are truth and his ways are justice, and because those who are walking in pride he is able to humiliate. Nebuchadnezzar (8) The remnant of the 1NC saints in the second presence, in particular Charles Taze Russell. Dew (3) of the heavens The heavenly water baptism of the faithful during the Gentile Times into the 1AC. 7 Times (2 - narrative) 7 Prophetic Times from 607Tishi to 1914Tishri, The Gentile Times, 2520 years. Babylon (2) Babylon the Great, the prison for God's true people, the sons of the 1AC. This is all false religion. Walking on the Royal Palace Jesus was walking around the palace in Ezekiel! Chaldeans (1) Citizens of Babylon the great. Everyone in all false religions. Isn't this the Great [nation] that I myself built ? Yes, the physical nation of Israel, over which Jesus was the guardian and king and prophet, for all the thanks he got. King David and lastly King Jehoahaz, were actually earthly vassals of Jesus, who is the heavenly vassal of God. All Kingships are over visible children of Abraham i.e. genetic until the end of the LCC. No kingship is directly over the sons of the 1AC under the CRC, but these can feed from the tree nonetheless.